What south Louisiana does have in the way of fall centers on the seasonal harvest: pecans falling from the trees; oysters plucked from cooler, saltier waters; baked fresh sweet potatoes; and sugarcane moving from the field to the mill, filling the air with burnt-marshmallow smoke. To me, the essence of MY fall isn’t leaves and pumpkins–it’s the smell of the sugar grinding mill billowing out clouds of steam, the smell of a cut-over cane field fermenting in the rain, of being stuck in traffic behind cane-cutting machinery as it chugs down a two-lane bayou road. At this time of year, I crave the browned flavor of Steen’s cane syrup, and I’m always looking for new ways to showcase the bittersweet elixir. Enter the salted butter caramel: a cubic inch of Steen’s-infused, chewy goodness, inspired by this David Lebovitz recipe. I followed his recipe’s methodology and proportions, simply substituting Steen’s for the corn syrup or brown rice syrup specified in the original recipe. The swap worked beautifully….the caramels weren’t too dark, either in color or flavor. Lebovitz’s recipe requires the use of a candy thermometer, but otherwise, it’s simple enough. Sugar and cane syrup cook together to 310 degrees, then warmed cream is added. The mixture cooks to 260 degrees, then a little butter is added and the caramel is poured into a loaf pan lined with buttered foil. 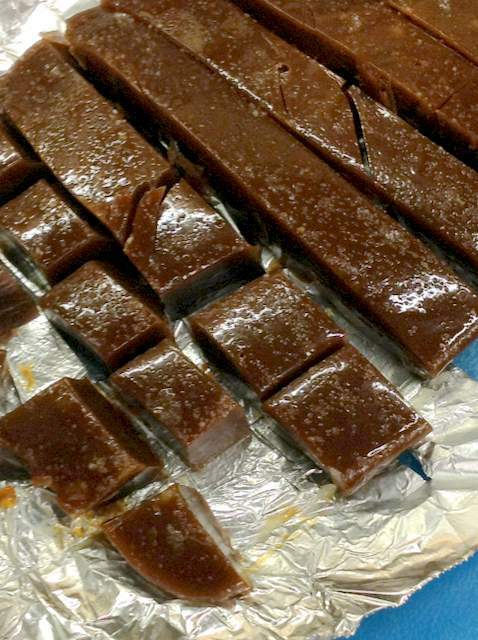 After a short cooling off, flaky sea salt is sprinkled atop the caramels, completing the sweet-salty-chewy confection. Can’t get enough Steen’s cane syrup? See more of my Steen’s-centric recipes: pecan spiral bread, a killer popcorn ball with pecans, the classic gateau di sirop, and spicy cane syrup cookies. I enjoy your weekly postings. I played around with a Pizza Bianca recipe on Saturday in my wood fired oven and was very happy with how it came out. I ended up bringing it to a Umami dinner party our friends held on Saturday evening where I received great reviews. It stayed crisp on top and bottom all evening with great chew and air bubbles inside. This was my second try at it – first I was not happy with. I have my father’s side of the family in a small town outside of Rome – and last time we were there I brought a piece home to freeze – so I could compare. I have photos posted on my Facebook page – search Anthony Martini ( my photo is of me leaning over my wife for the photo – I also live in Elgin, IL ) – Let me know if you can see the photos – if not you can send a friend request if you’d like. If this doesn’t work I can send you photos if you care to see them. Glad to know of your success with the pizza bianca….the texture is everything with PB, isn’t it? And good olive oil to liberally drizzle on top. Kudos to you for mastering it! 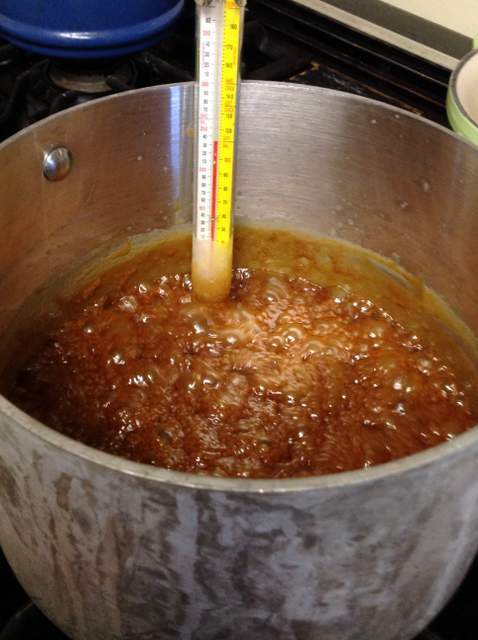 For the caramels….is it crucial to use a copper pot ? ans what is the best way to clean the pot after wards with the sticky/hard candy ? I used a stainless steel pot. Specifically, an All Clad pot, but any heavy saucepan will do. Definitely NOT essential to use a copper pot. I soaked the pot in water for a while and the sugar dissolved just fine. Let it soak in hot, soapy water and you shouldn’t have any problems. Candied or caramelized sweet potatoes are yummy. Steen’s has a recipe index on steensyrup.com website, too. Their baked ham looks like a winner.